As an Advanced Partner and Authorized Reseller of vMix, Stream Dudes has the knowledge needed to support, recommend, and integrate with this innovative product. Having the ability to work with a powerful, 4K video production software solution, allows you to create broadcast quality productions at a fraction of the cost of traditional video production workflows. 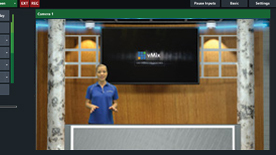 vMix gives you the power to seamlessly switch between multiple camera sources, playback videos clips, utilize chroma key to create stunning virtual sets, mix various audio sources, create custom titles, and integrate with social media- creating a powerful video production solution that is as portable as it is complete. 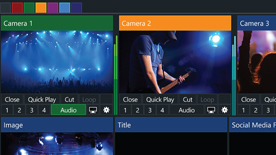 Best of all, with vMix you can record independent channels (ISO record) of video, stream (up to three independent streams) to multiple destinations simultaneously and connect with other devices via NDI. 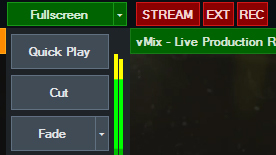 The fact that vMix software is intuitive and reliable also makes it very easy for Stream Dudes to support. Multiple Video Cameras Formats and Support – 4K, HD and SD capable. Easy DVD Playback – Complete with menu navigation. Support for Multiple Audio Devices – Mix multiple audio sources such as analog, pre-recorded or embedded audio. Simultaneous Stream to Up to 3 Different Destinations – This could include a live stream to UStream, one to YouTube and another to Twitch simultaneously (bandwidth permitting). Virtual Capture Support for Streaming to 3rd party software – Such as Skype, Google Hangout and VLC. 13 Transition Effects with 4 Customizable Transitions Buttons – Cut, Fade, Zoom, Wipe, Slide, Fly, Cross-Zoom, Fly/Rotate, Cube, CubeZoom, Vertical Wipe, Vertical Slide and Merge transitions. Efficient Software – vMix is the most efficient live production software on the market thanks to full 3D acceleration. Built-in Virtual Sets and Chroma Key – vMix comes with a powerful keyer that makes it easy to use a variety of preconfigured virtual sets, complete with virtual zoom. If you need more sets, you can simply add on via the Virtualsetworks add-on packs or simply create your own. Screen Capture from Remote Computers – Great for PowerPoint and ProPresenter. Audio Capture support is also available. 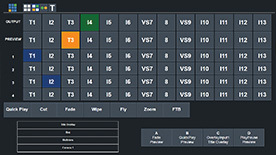 Built-in Title Templates – Easily add and edit a Title or Scoreboard from the many built in templates during a live production or build your own using any Graphics or Vector editing software. Instant Replay and Video Delay – Create a Video Delay input and assign it to any available Camera or Output. Save multiple video clips (or highlights) of notable events for playback at a later time, with configurable slow motion playback from 5 to 400%. Built-in Audio Mixer – Keep track and control all audio sources including the ability to Mute, Follow (Auto Mixing) and Delay any source. A VU Meter is also included with a peaking display to ensure each inputs level is broadcast ready. vMix Call – Easily add up to 8 remote guests to your live show. Built right into vMix HD, 4K and Pro editions, vMix Call allows anybody with a browser and webcam to become an instant guest- no extra software is needed and it is FREE. Live Video Effects and Adjustment – Color Correct, De-interlace, Sharpen, Zoom, Rotate, Pan, and Crop any input in real time. All effects are processed in 4:4:4 32bit color space for optimal video quality. 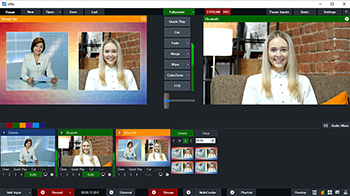 Custom, Side-by-Side Video – Using the “Multi View” effects combines different sources together to create a seamless side-by-side video presentation, as seen used by most news programs (think double box effect). Customize the position of each element with the available Zoom, Pan, Rotate and Crop controls for a unique effect. 4 Video Overlay Channels – In addition to the Multi View feature. vMix includes 4 overlay channels (similar to a DSK, but with more options) that have its own transition effect, position and border. vMix Web Controller – Control your vMix remotely via your Surface, iPad, Android or other touch screen device using the built in web interface. Customizable shortcut buttons can also be created to activate common production scenarios. vMix Social – Bring in live Tweets, Facebook Comments or even messages from any IRC chat room in real-time via vMix Social. Content can even be approved and viewed remotely via a browser interface. The vMix powered GO by ACME (a predecessor to the vMix GO) harnesses all of the power of vMix software and puts it into a box about the size of a suitcase. Featuring up to 8 SDI Inputs (fully configurable to be either inputs or outputs- including 4K support), balanced XLR/TRS combination audio inputs and outputs, internal 4 channel instant replay, capacity for up to 6 removable SSD, and a built-in HD monitor- the GO is a truly portable, all-in-one, video production solution. 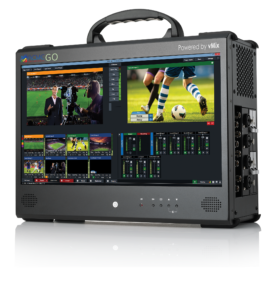 Taking all of the best features of the vMix GO and putting into a more affordable package, the new vMix Powered ACME GO 4/4K is perfect for those times when only 4 SDI Inputs are needed. Like the GO Plus, the GO 4/4K still features fully configurable inputs or outputs, balanced XLR/TRS audio connections, 6 removable SSD drive bays, and the same, portable, all-in-one design, utilized in the larger input models. If budget is a concern, then check our the Production Bot or check out our own line of Dude PCs. The “Dude Rack” series is a complete live production system packed into a compact footprint. Like our Dude PCs, the Dude Rack is powered by vMix- a versatile, live production software that can be used to power your entire live production. With up to 8 camera inputs- switching, streaming, chroma key, ISO recording, multi-bitrate HD streaming, graphics titling, video playback and much more are all at your fingertips for much less than the competition. With SDI inputs and NDI connectivity, the Dude Rack can easily be plugged into any existing workflow to enhance your current productions. As an Advanced Partner and Reseller of vMix, Stream Dudes is your best resource and knowledge base in the Midwest. Carrying this distinctive certification means that you can be assured that you are purchasing from a reputable source who will not only help you purchase the right vMix solution, but can ensure that you receive proper training as well. In addition to helping you purchase a vMix system, we also have the ability to build and custom configure a vMix Reference System to meet your specific needs. To get started with setting up a vMix video production solution or to learn more about customized workflows, Contact Us for more information.